By appointment only, please contact us to arrange a time to visit. Full Circle brings together a selection of artists featured in previous See Think Different exhibitions as well as artists new to the project. Focussing on ideas of continuity and change, the exhibition will alter throughout the course of the year. Works will be re-arranged and replaced by new elements, the list of participating artists growing as the exhibition progresses. Bringing together a diverse range of artists and works, Full Circle explores both the continuation and evolution of ideas within individual artistic practice. The exhibition will also include a number of site specific works which have been specially commissioned for the project. The works of Christopher Bond often appropriate from popular culture and the real world. In his light-box works, previously shown at UBM in Signs of the City, Bond used re-claimed shop signs to create witty, phonetic statements that utilised the iconic typefaces of the city. 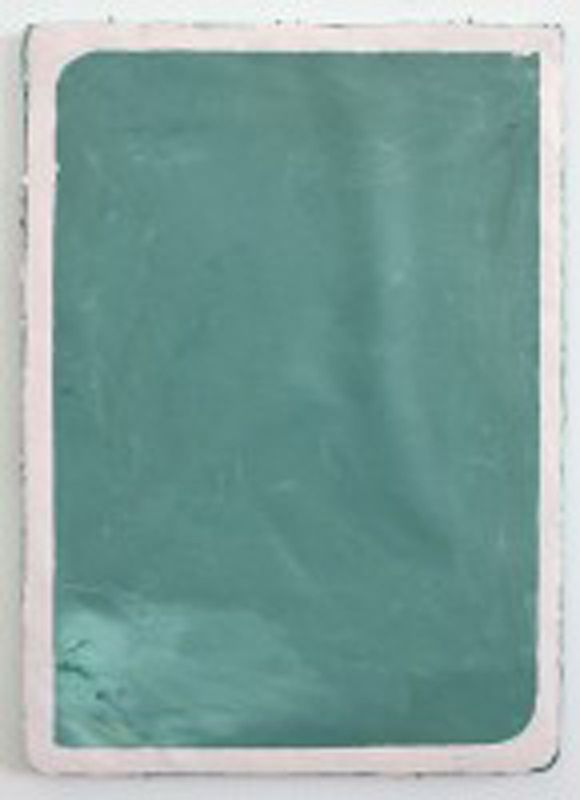 His most recent works on paper demonstrate a continued interest in appropriation and text, but also a move towards the exploration of psychological states and the complex interplay between the unconscious and conscious. 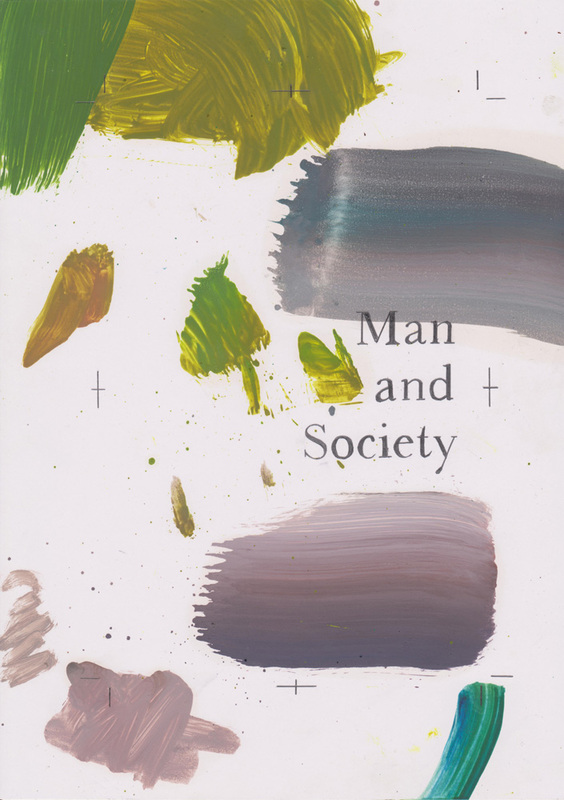 His colourful and gestural grounds exist as a consequence of testing brush strokes and using the paper like a palette, whilst the precise typographic layouts drawn on top faithfully reproduce actual book covers from popular culture, philosophy and psychology. 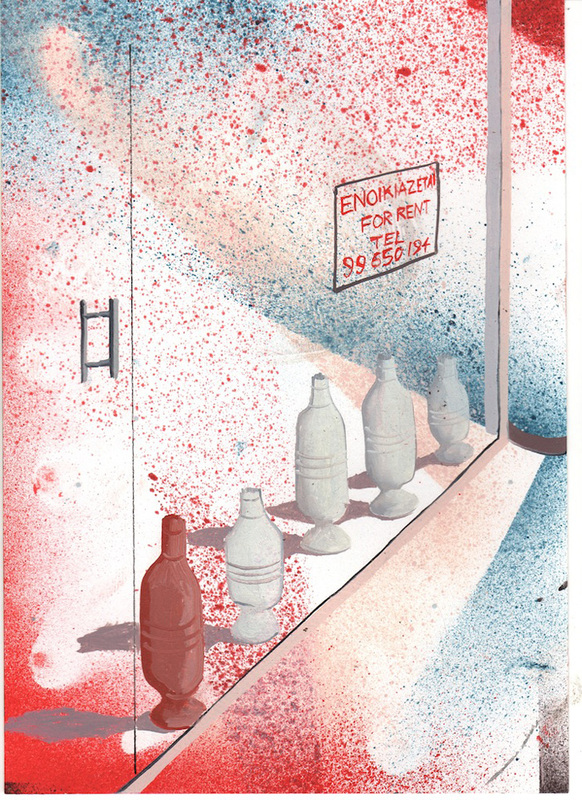 The works of Marcus Cope, included in the exhibition, are part of a forty-eight series of drawings made this spring in Lemba, Cyprus. The drawings return to the same subject matter: canvases, paintings, paint tins, walls. This is a painter’s world, merged with memories of his time in Cyprus – of places visited, nightscapes, shop windows and abandoned derelict buildings. In this series, Cope has worked under tight constraints, using sprayed grounds and a limited palette of 4 colours. Made during a self-imposed break from painting, the drawings show a painter daydreaming about the possibility of painting again and exploring the process from the distance of the pen and paper. 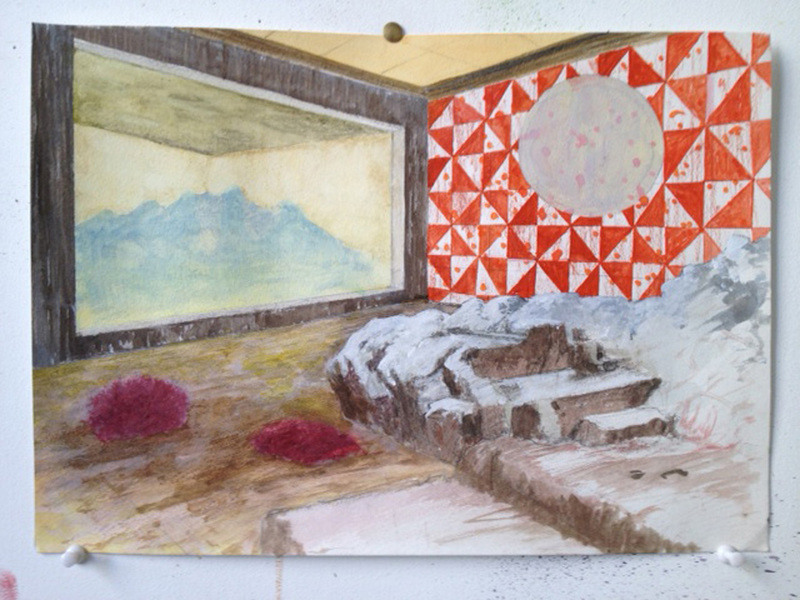 The paintings and drawings of Ben Deakin explore ideas of wilderness, focussing in particular on how our nostalgia for nature has been inherited from the 19th Century Romantics. Many of Deakin's paintings incorporate the iconography of this period such as mountains, forests and glaciers. Whilst previous paintings referenced real life landscapes, his most recent works are amalgams of places real and imagined – fantastical spaces more akin to stage sets, where a mountain-scape could just as easily be a theatrical backdrop. Observation of nature and the elements are linked inextricably within the work of Haruka Hashiguchi. Whilst previous works documented the movements of sunlight and shadow at a particular time and place, her most recent Meristem series is concerned with light's constant change over the surface. Working to self-imposed rules and parameters, Hashiguchi embroiders rings of stitches which are layered from the centre to the outer, each ring reproducing the previous like a tree's growth rings. 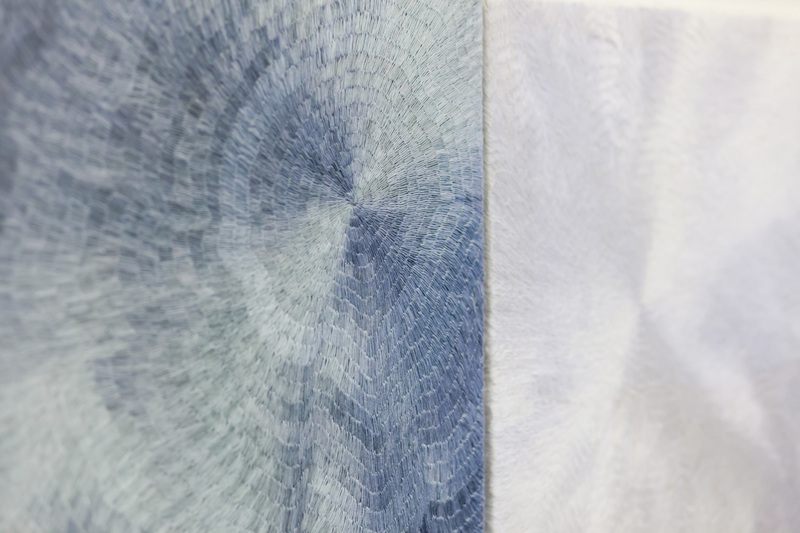 The delicate variations of colour within the works are created through experimental dying processes using natural materials such as leaves, bark and flowers. 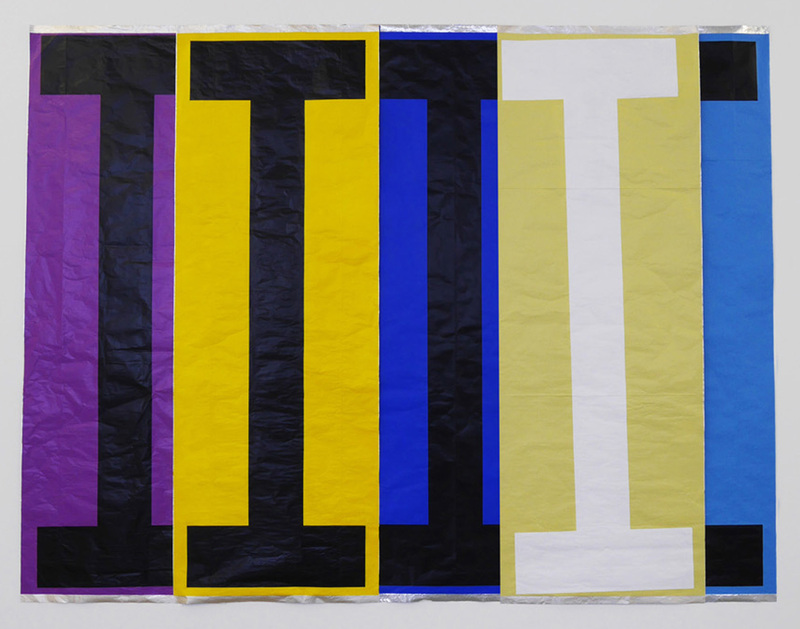 In the paintings of Andy Jackson, painterly marks oscillate between abstraction and representation. Pristine, smooth surfaces contrast with textures and geometric planes. Painterly forms bring to mind organic matter, marble, slate, fossils or archeological traces. 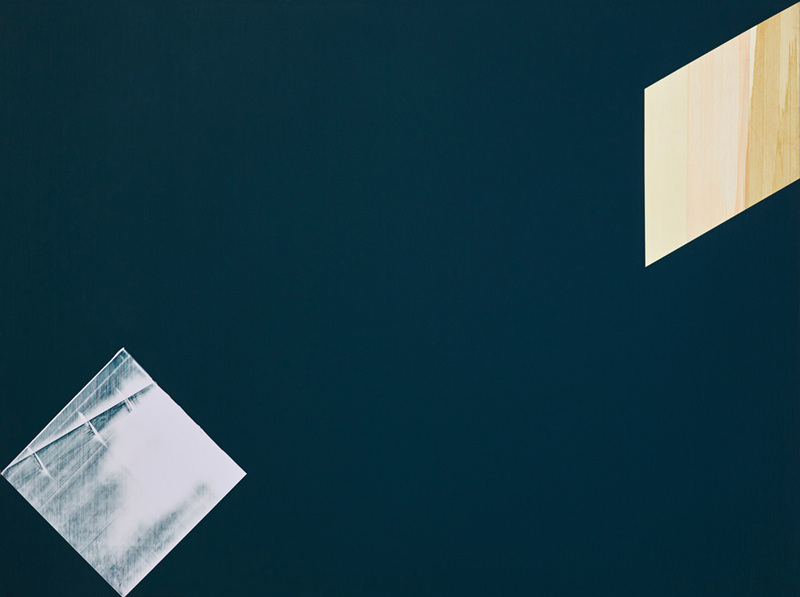 Constructed using layers of under painting, gestural mark making, squeegeed surfaces and masked geometric forms, Jackson’s paintings explore and exploit the illusionistic potential of abstraction. 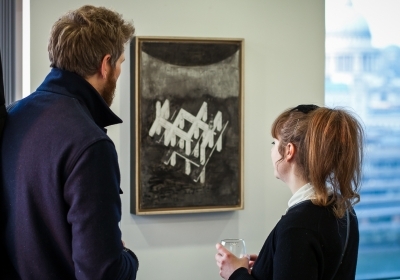 The paintings in the exhibition are taken from two concurrent series – a large series of expansive, monochromatic fields that are combined with isometric forms and smaller scale works entitled ‘Datum’ which are framed, screen-like dark voids of ‘glowing painterly matter’. The works of Inês Rebelo look to outer space and cosmology. 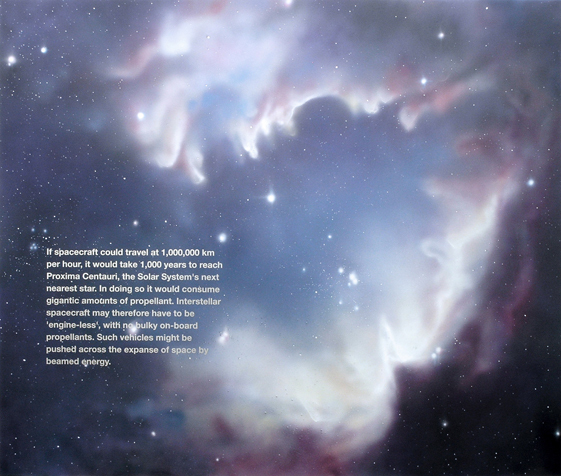 Her paintings often combine images of distant galaxies with texts from scientific publications used to map and study distant events. Rebelo's re-contextualised and re-presented facts often carry a humorous tone by confronting us with the absurdity and ultimate futility of mapping and creating diagrams as a means of understanding our place in space. The site specific installation Attempt to Find the Snark #5, which has been specially commissioned for Full Circle, maps the northern hemisphere night time sky on the exhibition's opening night – 31 March 2014. 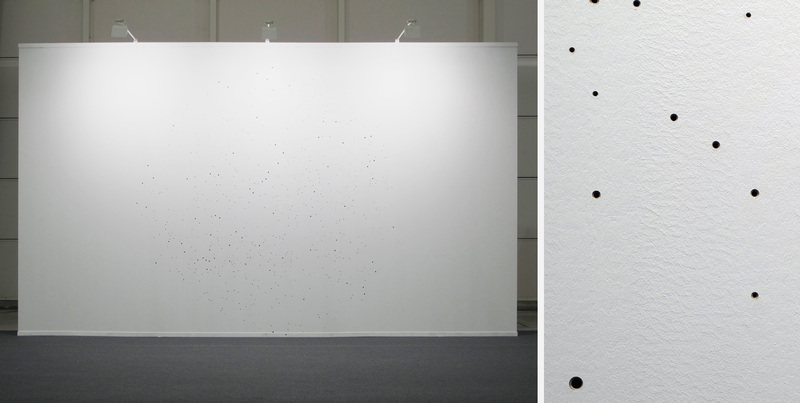 The holes, drilled directly into the wall, represent stars which are scaled by the intensity of their brightness when viewed from earth. The works of Keith Roberts often combine raw, industrial materials (clay, plaster, sheets of metal) in addition to found objects (tin cans, wall boards). Whilst previous works looked at how materials change and deteriorate over time, Robert’s most recent sculptures and paintings explore the manipulation of both object and function. 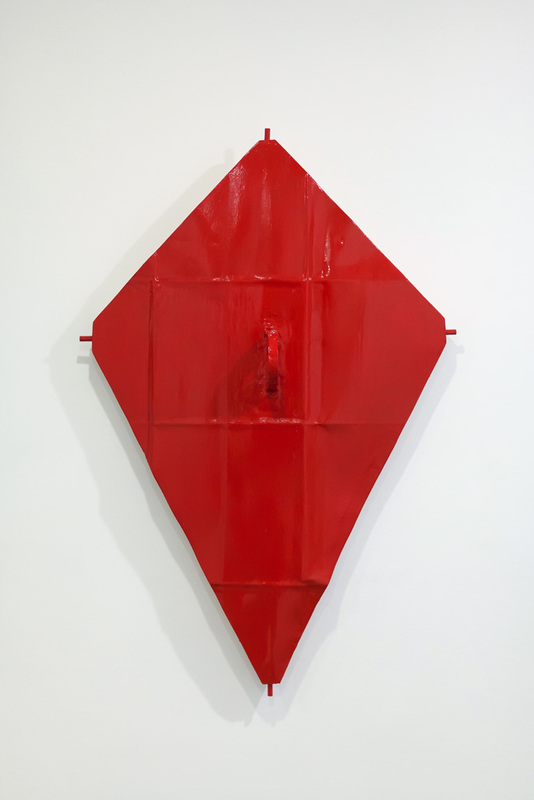 A kite, cast in plaster becomes like metal when painted with enamel paint. A painted surface bears the distinctive markings of lead. These transmutations are not literal ones, but act as challenges to the way we understand materiality – where something weightless can appear heavy and the fragile seem solid and unbreakable. Lizi Sanchez's work is born of time-intensive material processes that imitate, but essentially contrast with, those of the mass market and the glossy high-end manufacturing of boom-time art production. Drawn towards materials commonly associated with packaging and display such as gift wrapping, ribbon and glitzy baubles, her collages and sculptures look at making and production in a market-driven world where surface, style and presentation are the ultimate end. Her site-specific work IIIII, has been specially commissioned for this exhibition. The works of Belén Uriel are largely concerned with the ways in which Modernism has shaped our aesthetics and social habits. Her works draw attention to the ubiquity of designed goods within daily life and the power that design has to alter collective habits and the way that we function within the home. 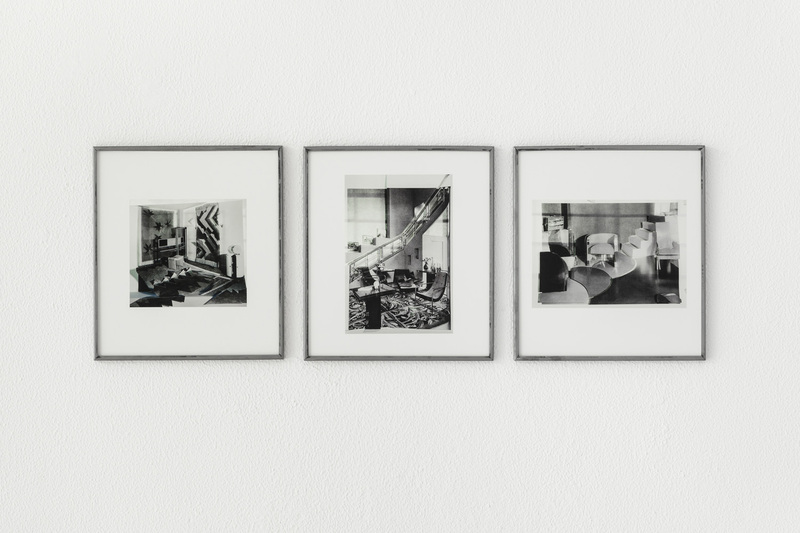 In the series Good Companion Rooms (old and new side by side), Uriel uses photomontage to reconstruct appropriated photographs using their own fragments. Surfaces show slight alternations in tonality and sharpness and objects appear slightly askew. Dimensionality starts to break down, revealing the deceptive nature of the polished perfection of the bourgeois interiors that they depict. In his latest paintings, Ross Walker explores ideas related to functional spaces and the objects, colours and surfaces that they are filled with. Incorporating objects and materials commonly associated with corporate spaces and rental properties such as carpet tiles, message boards, mass produced fabric and decorative kitchen vinyl, Walker highlights the blandness and neutrality of modern-day design. The painted marks within his works - often in tones of magnolia and pastel - are less like painterly gestures and more akin to marks associated with trade and function. Part of See Think Different - a collaboration between Drawing Room and UBM. Full Circle is the fifth exhibition curated by Drawing Room in collaboration with UBM plc for the top floor of UBM’s London headquarters building. Now in its third year, See Think Different aims to promote and support emerging artists within a local – and global – company environment. During the exhibitions, Drawing Room curators and participating artists give lunch time talks, enabling UBM staff to gain further insight into the exhibition and find out more about the artists involved. 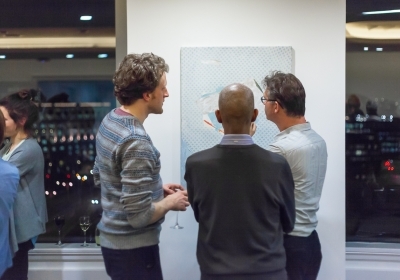 This collaboration also trains an emerging curator, providing them with the opportunity to support the professional development of emerging artists within Southwark and to gain invaluable practical experience of working collaboratively with both Drawing Room and UBM.